How Long Until I'm Wealthy? How Long Until I’m Wealthy? Since my mid-20’s, I made financial net worth goals for our family. I’d calculate our current net worth, add additional savings, and punch in an expected rate of return over the period, usually five to ten years. Occasionally, I go back and review prior goals. No matter what the market, over the long term we have met or surpassed the objectives. Set financial goals, make a few minor lifestyle changes and you may be surprised that you can become wealthy without a major upheaval in your lifestyle. Click here if you want to solve your investing problems. Learn how long it takes to meet or surpass your financial goals. When you have an idea of how long it takes until you’re wealthy at certain savings levels, you’ll feel better. Here’s how certain wealth building parameters will play out. I’m not going to lie, life is all about trade-offs, and if you’re unwilling to compromise and give in order to get, then financial security may not be in your future. The good news is, although difficult at first, if choosing low-cost alternatives or cutting out indulgences a habit, it will be difficult in the beginning. But, I promise, that if you commit to making a few changes now in your saving, spending and lifestyle, your future will be better financially. When you hit the supermarket, do you go through and buy without price checking? If so, you can save thousands of dollars each year by simply watching the unit cost on the label and buying products with lower unit costs. When you eat out do you regularly order drinks and dessert? Cut out more expensive items and save. Clarity app will help you cut unwanted subscriptions and cut spending easily. It’s a snap to download and makes maximizing your money fun. There are many ways to save, and actually, you can make it a game, by challenging yourself to meet certain goals. Auto transfer cash from your paycheck into savings and investing accounts. You might consider saving in your 401(k) at work and another investment account outside work as well. Maybe even set up a simple automated investment program with WiseBanyan or another low-fee digital advisor. Divide investments among stock (60%) and bond (40%) mutual or exchange traded funds. The historical average annual return of 60% stock funds and 40% bond funds is 7.4%. To be on the conservative side, I’m going to assume an annual return for this portfolio of 7%. Obviously, these are assumptions, you may want to invest in a different way to suit your risk tolerance or age better. Your asset allocation depends upon many factors. Yet, if you’re curious about various savings amounts and how they’ll translate into future wealth with a 7% return, check out this chart. 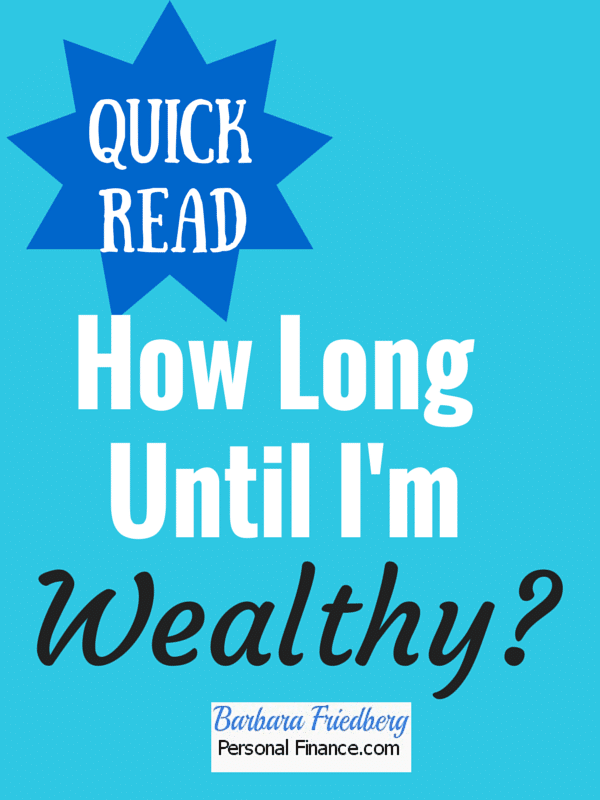 How Long Will it Take Until I’m Wealthy? At an annual return of 7% per year, how long until you are wealthy? If you save $100 per month, in 40 years you will have $242,481.00. Increase that to $800.00 per month and you’ve got over 2 million dollars after 40 years investing. Drop your monthly investment to $500.00 and invest for 30 years. You still wind up with a nest egg of over $600,000.00. Not bad. There are no guarantees in life but regular savings and investing will definitely make you wealthier than spending! Finding the balance between spending and saving leads to pleasure now and financial security in the future. Download my free microbook- How to Invest and Outperform Most Active Fund Managers. It’s straightforward and will get you started to prosperity. Barbara Friedberg Personal Finance teaches wealth building skills. Pay attention, be patient, don’t overspend on stuff that doesn’t last; save, invest, and you can become rich. Take action to hit your wealth target. Barbara, thanks for laying this out so clearly. It’s much better to have a plan than to just “save as much as we can” and hope for the best–your chart makes it obvious. It’s hard to deny the facts when they are staring at you in black and white! As they say, if you fail to plan, you plan to fail. Your article shows that starting early and consistent savings pay off! Personally, I think it should start with your very first job. If you set up a payroll deduction, you almost don’t miss it. I love breaking down goals into micro goals like that. Most people can save $100 a month or $3 bucks a day! @Krantcents-In fact, I had El Carino open his first IRA 2 months into our relationship. I don’t think he regrets it a bit. @Evan-Acquiring wealth really is not difficult with the proper knowledge and attention. Barb, cutting out the whining is a great goal! lol Nothing like the facts to do that! Barb, excellent post, I love the way you demonstrate that that even the most conservative expected return can make us all wealthy over the long term. I have included this in a similar article of mine! @Krantcents – its so true that you almost don’t miss it, I have mine set up to automatically come out of my account before i even have a chance to think about it! Great summary, Barb. I’ll echo krantcents’ comment, but from a slightly different perspective… your examples shows why it’s so important to teach our kids about the power of compound interest, and encourage them to take advantage of time by beginning their retirement savings as early as possible (even before they have a job, if possible). @Dennis, You raised a very important point. With very few exceptions, most of us need patience in order to accrue true financial wealth. Get rich quick schemes do not work!And it does require a willingness to delay some gratification. @Len-Thanks for reiterating the imporance of time in the equation! With unlimited longevity, we could all easily become millionaires! I like how you broke down the stocks and bonds percentages. Do you really think we can expect an average return of over 7% over the next 30 years? My husband and I were just discussing how savings rates are so low and have been for 10 years. We remember when we were kids in the 80’s that they were up to 12%! We can’t fathom them returning to this rate any time soon. Of course, savings rates aren’t the same as stock returns, but still. Am I being to gloom-and-doom? Will we see these returns again? I hope so! I’ve been spending a lot lately but am close to the savings goal of ~50% too, so I figure I may as well reward myself a bit so things don’t get too austere! 😉 Later if there’s kids around might not be so easy to get near 50% savings and still have spending money. @Little House, Your comment is so important that I am going to respond in an entire article in the next week or two, as I have a lot to say. But not to leave you hanging, the short answer is diversify across the entire world with stocks and bonds and yes, I believe a sensible asset allocation is likely to yield a 7% return. But stay tuned, I’ll respond to your entire comment along with ideas for better (and safe) yields this month. Great question. @Kevin, I couldn’t agree more with your entire comment. Now is the time to sock it away, also, as you are young,and if you have the stomach for it, there’s nothing wrong with bulking up your stock allocation (international index funds are great!). Also important to spend and splurge a bit too! Great comment. @Paula, Great start, keep up the good work, and don’t discount your efforts. You are definitely on the right track. Excellent article as well as the follow up comments. The part I would like to emphasize is that it doesn’t happen over night and the small investments we make today work together for a healthy nest egg down the road. The beauty in this outline is its simplicity; there is no budget or income out there where this type of planning does not apply. Take out a budgeted sum each month, and allow the savings to work for you rather than against you with the best savings account opportunity. @Financial Advising-You hit the nail on the head. If the plan is not simple, it will not be followed. I am all about trying to break down personal finance into manageable steps and help readers understand that it does not need to be complicated. It’s nice to know that you can end up with over $2 million after 40 years of investing $800 a month. But what some people may overlook is that you’re only investing a total of $384,000 of your own money. In other words, your money grows by over FIVE times your original investment! @Darren, Thank you so much for adding that point. It makes the entire scenario that much more powerful. Compound interest/returns are phenomenal. Now, if we all had unlimited time, wealth would be no problem.